The number of shares of common stock, par value $0.001 per share outstanding as of August 2, 2016 was 205,000,000. Nemaura Medical Inc. (“Nemaura” or the “Company”), through its operating subsidiaries, performs medical device research and manufacturing of a continuous glucose monitoring system (“CGM”), named ‘sugarBEAT.’ The sugarBEAT device is a non-invasive, wireless device for use by persons with Type I and Type II diabetes, and may also be used to screen pre-diabetic patients. The sugarBEAT device extracts analytes, such as glucose, to the surface of the skin in a non-invasive manner where it is measured using unique sensors and interpreted using a unique algorithm. Nemaura is a Nevada holding company organized in 2013. Nemaura owns one hundred percent (100%) of Region Green Limited, a British Virgin Islands corporation formed on December 12, 2013. 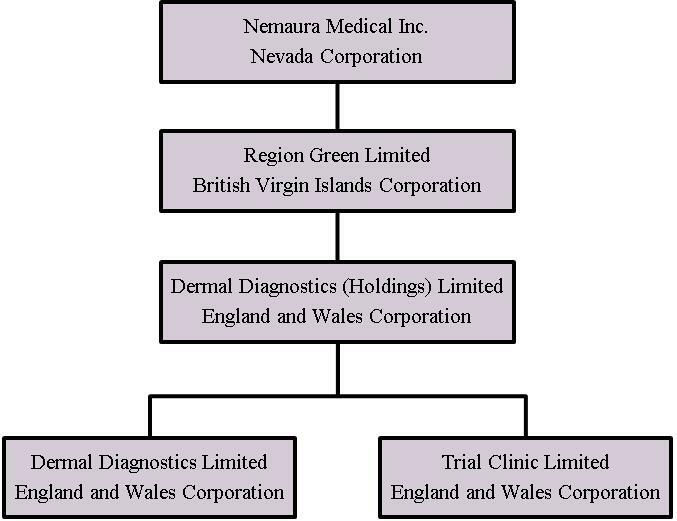 Region Green Limited owns one hundred percent (100%) of the stock in Dermal Diagnostic (Holdings) Limited, an England and Wales corporation formed on December 11, 2013, which in turn owns one hundred percent (100%) of Dermal Diagnostics Limited, an England and Wales corporation formed on January 20, 2009 (“DDL”), and one hundred percent (100%) of Trial Clinic Limited, an England and Wales corporation formed on January 12, 2011 (“TCL”). DDL is a diagnostic medical device company headquartered in Loughborough, Leicestershire, England, and is engaged in the discovery, development and commercialization of diagnostic medical devices. The Company’s initial focus has been on the development of the sugarBEAT device, which consists of a disposable patch containing a sensor, and a non-disposable miniature electronic watch with a re-chargeable power source, which is designed to enable trending or tracking of blood glucose levels. The accompanying consolidated financial statements include the accounts of the Company and the Company’s subsidiaries, DDL, TCL, DDHL and RGL. The consolidated financial statements are prepared in accordance with the instructions to quarterly reports on Form 10-Q. In the opinion of management, all adjustments (which include only normal recurring adjustments) necessary to present fairly the financial position, results of operations and changes in financial position at June 30, 2016 and for all periods presented have been made. Certain information and footnote data necessary for fair presentation of financial position and results of operations in conformity with accounting principles generally accepted in the United States of America have been condensed or omitted. It is therefore suggested that these financial statements be read in conjunction with the summary of significant accounting policies and notes to financial statements included in the Company’s Annual Report on Form 10-K for the Year Ended March 31, 2016. The results of operations for the period ended June 30, 2016 are not necessarily an indication of operating results for the full year. The functional currency of the Company is the Great Britain Pound Sterling (“GBP”). The reporting currency is the United States dollar (US$). Stockholders’ equity is translated into United States dollars from GBP at historical exchange rates. Assets and liabilities are translated at the exchange rates as of balance sheet date. Income and expenditures are translated at the average exchange rates prevailing during the reporting period. Adjustments resulting from translating the financial statements into the United States dollar are recorded as a separate component of accumulated other comprehensive income in Stockholders’ Equity. The Company continually assesses any new accounting pronouncements to determine their applicability. When it is determined that a new accounting pronouncement affects the Company’s financial reporting, the Company undertakes a study to determine the consequences of the change to its consolidated financial statements and assures that there are proper controls in place to ascertain that the Company’s consolidated financial statements properly reflect the change. In May 2014, FASB issued ASU No. 2014-09 “Revenue from Contracts from Customers,” which supersedes the revenue recognition requirements in “Revenue Recognition (Topic 605),” and requires entities to recognize revenue in a way that depicts the transfer of potential goods or services to customers in an amount that reflects the consideration to which the entity expects to be entitled to the exchange for those goods or services. In July 2015, the FASB extended the effective date of ASU 2014-09 by one year, to now be effective for fiscal years, and interim periods beginning after December 31, 2017, and is to be applied retrospectively, with early adoption now permitted for fiscal years, and interim periods beginning after December 15, 2015. The Company is currently evaluating the new standard and assessing the potential impact on its operations and financial statements. In August 2014, the FASB issued ASU No. 2014-14, “Presentation of Financial Statements – Going Concern: Disclosures about an Entity’s Ability to Continue as a Going Concern.” The new standard requires management to perform interim and annual assessments of an entity’s ability to continue as a going concern within one year of the date the financial statements are issued. An entity must provide certain disclosures if conditions or events raise substantial doubt about the entity’s ability to continue as a going concern. The new guidance is effective for annual periods ending after December 15, 2016, and interim periods thereafter. The Company is currently assessing the impact of the adoption of the ASU No. 2014-14 on its financial position, results of operations and financial statements disclosures. In March 2014, the Company entered into an Exclusive Marketing Rights Agreement with an unrelated third party that granted to the third party the exclusive right to market and promote the sugarBEAT device and related patches under its own brand in the United Kingdom and the Republic of Ireland, the Channel Islands and the Isle of Man. The Company received a non-refundable, upfront cash payment of GBP 1,000,000 (approximately $1.332 million and $1.432 million as of June 30, 2016 and March 31, 2016 respectively), which is wholly non-refundable, upon signing the agreement. As the Company has continuing performance obligations under the agreement, the upfront fees received from this agreement have been deferred and will be recorded as income over the term of the commercial licensing agreement. In April 2014, a Letter of Intent was signed with the third party, which specified a 10 year term and in November 2015 a Licence, Supply and Distribution agreement with an initial 5 year term was executed. In addition, in November 2015, we entered into a joint venture agreement with the third party, whereby we will share the costs and net profits of the sales of the sugarBEAT system in all territories in Europe, with the exception of the territories that are subject to the separate licensing agreement as described above. The full commercial agreement is expected to be signed towards the end of 2016. Nemaura Pharma Limited (Pharma) and NDM Technologies Limited (NDM) are entities controlled by the Company’s majority shareholder, DFH Chowdhury. Pharma has invoiced DDL and TCL for research and development services. In addition, certain operating expenses of DDL and TCL were incurred and paid by Pharma and NDM. In accordance with the United States Securities and Exchange Commission (SEC) Staff Accounting Bulletin 55, these financial statements reflect all costs associated with the operations of DDL and TCL. While certain costs incurred by Pharma and NDM are directly attributable to DDL and TCL, other costs were shared between the organizations. Management believes the methodologies used are reasonable and that the costs allocated are not materially different from what they would have been had Pharma and NDM been unaffiliated entities. DDL and TCL advanced Pharma certain amounts to cover a portion of the costs. The balance due to Pharma at March 31, 2016 consists primarily of cash advances received from Pharma of approximately $228,000 during the year ended March 31, 2016 and amounts owed on invoices received from Pharma during the year of approximately $331,000. During the three months to June 30, 2016, the increase in the balance due to Pharma is primarily due to invoices of $209,000 received from Pharma. These amounts are unsecured, interest free and payable on demand. The Company has experienced recurring losses and negative cash flows from operations. At June 30, 2016, the Company had cash of $8,494,149, working capital of $7,723,168, stockholders' equity of $6,654,567 and an accumulated deficit of $6,095,550. To date, the Company has in large part relied on equity financing to fund its operations. Additional funding has come from grants and related party contributions. The Company expects to continue to incur losses from operations for the near-term and these losses could be significant as product development, clinical and regulatory activities, consulting expenses and other product development related expenses are incurred. · developing the sugarBEAT device for commercialization. There was no revenue recognised in the three months ended June 30, 2016 and 2015. In March 2014, we received an upfront non-refundable cash payment of GBP 1,000,000 (approximately $1.67 million) in connection with an Exclusive Marketing Rights Agreement with an unrelated third party that provides the third party the exclusive right to market and promote the sugarBEAT device and related patch under its own brand in the United Kingdom and the Republic of Ireland, the Channel Islands and the Isle of Man. We have deferred this licensing revenue until we complete our continuing performance obligation, which includes securing the CE marking of the sugarBEAT device and patch. We expect to record the revenue in income over an approximately 10 year term from the date CE marking approval is obtained. Although the revenue is deferred at June 30, 2016, the cash payment became immediately available and has been used to fund our operations, including research and development costs associated with obtaining the CE marking approval. Research and development expenses were $306,081 and $264,279 for the three month periods ended June 30, 2016 and 2015, respectively. The increase was due to higher spend with sub-contractors who are further developing the device to get it market-ready. We expect research and development expenses to continue to be a significant cost in future periods as we continue our clinical studies of our sugarBEAT device and pursue our strategic opportunities. General and administrative expenses were $188,102 and $138,547 for the three month periods ended June 30, 2016 and 2015, respectively. The increase is due to additional legal and professional charges payable as we explore fundraising opportunities. We expect general and administrative expenses to increase going forward in the long term, as we move our technologies forward toward commercialization and incur additional costs and expenses related to ongoing compliance with SEC reporting. For the periods ended June 30, 2016 and 2015, other comprehensive loss was $530,015 and $11,388 respectively, arising from foreign currency translation adjustments. We have experienced net losses and negative cash flows from operations since our inception. We have sustained cumulative losses of $6,095,550 through June 30, 2016 as technical development has continued. We have historically financed our operations through the issuances of equity, UK government grants, and contributions of services from related entities. Our cash position was $8,494,149 as of June 30, 2016. Whilst our current cash position at June 30, 2016 is sufficient for the next stage of clinical studies and the initial scale up of our manufacturing, our long term business plan is contingent upon our ability to raise additional funds. This may include a combination of debt, equity and licensing fees. If we are not successful in raising the funds needed in the specified timelines, the target dates for the achievement of the milestones will be extended. We believe the cash position at June 30, 2016 is adequate for our current level of operations for the next 12 months and for the achievement of certain of our product development milestones. Our plan is to utilize the cash on hand to establish commercial manufacturing operations for commercial supply of the sugarBEAT device and patches. Net cash used by our operating activities for the three months ended June 30, 2016 was $219,398 which reflected our net loss of $494,183 together with a decrease in prepayments and other receivables of $34,573, an increase in accounts payable and other liabilities of $41,876 and advances from a related party of $193,419 Net cash used in operating activities for the period ended June 30, 2015 was $176,806, which reflected our net loss of $402,826 together with a decrease in prepayment to related party for clinical trials of $177,794 plus a decrease in accounts payable of $35,064. Net cash used in investing activities was $34,769 for the three months ended June 30, 2016, which reflected expenditures on intellectual property. For the three months ended June 30, 2016, net cash used in investing activities was $53,378 relating to the purchase of intellectual property and property and equipment. We have no off-balance sheet arrangements, including unrecorded derivative instruments that have or are reasonably likely to have a current or future material effect on our financial condition, changes in financial condition, revenues or expenses, results of operations, liquidity, capital expenditures or capital resources. The preparation of financial statements in conformity with accounting principles generally accepted in the United States of America (GAAP) requires management to make estimates and assumptions about future events that affect the amounts reported in the financial statements and accompanying notes. Future events and their effects cannot be determined with absolute certainty. Therefore, the determination of estimates requires the exercise of judgment. Actual results inevitably will differ from those estimates, and such differences may be material to the financial statements. The most significant accounting estimates inherent in the preparation of our financial statements include estimates associated with research and development, income taxes and intangible assets. Research and Development Expenses: The Company charges research development expenses to operations as incurred. Research and Development expenses primarily consist of salaries and related expenses for personnel and outside contractor and consulting services. Other research and development expenses include the costs of materials and supplies used in research and development, prototype manufacturing, clinical studies, related information technology and an allocation of facilities costs. Income taxes: Income taxes are accounted for under the asset and liability method. Deferred income tax assets and liabilities are recognized for the future tax consequences attributable to differences between the financial statement carrying amounts of existing assets and liabilities and their respective tax bases, and operating loss carry forwards. Deferred income tax assets and liabilities are measured using enacted tax rates expected to apply to taxable income in the year in which those temporary differences are expected to be recovered or settled. The effect on deferred income tax assets and liabilities of a change in tax rates is recognized in income in the period that includes the enactment date. A valuation allowance is provided to reduce the carrying amount of deferred income tax assets if it is considered more likely than not that some portion, or all, of the deferred income tax assets will not be realized. The Company recognizes the effect of income tax positions only if those positions are more likely than not of being sustained. Recognized income tax positions are measured at the largest amount that is greater than 50% likely of being realized. Changes in recognition or measurement are reflected in the period in which the change in judgment occurs. The Company has elected to classify interest and penalties related to unrecognized tax benefits as part of income tax expense in the consolidated statements of comprehensive income (loss). Intangible Assets: Intangible assets primarily represent legal costs and filings associated with obtaining patents on the Company’s new discoveries. The Company amortizes these costs over the shorter of the legal life of the patent or its estimated economic life using the straight-line method. The Company tests intangible assets with finite lives upon significant changes in the Company’s business environment and any resulting impairment charges are recorded at that time. Revenue Recognition: Revenue is recognized when the four basic criteria of revenue recognition are met: (1) a contractual agreement exists; (2) transfer of rights has been completed; (3) the fee is fixed or determinable; and (4) collectability is reasonably assured. The Company may enter into product development and other agreements and with collaborative partners. The terms of the agreements may include non-refundable signing and licensing fees, milestone payments and royalties on any product sales derived from collaborations. The Company recognizes up front license payments as revenue upon delivery of the license only if the license has stand-alone value to the customer. However, where further performance criteria must be met, revenue is deferred and recognized on a straight line basis over the period the Company is expected to complete its performance obligations. Royalty revenue will be recognized upon the sale of the related products provided the Company has no remaining performance obligations under the agreement. Recently issued accounting pronouncements: See Note 3 – Summary of Significant Accounting Policies to the accompanying financial statements for recently issued accounting pronouncements. We do not invest in any instruments for trading purposes. We have no outstanding debt instruments. Our operations generally are not directly sensitive to fluctuations in interest rates. We have not entered into any hedging transactions in an effort to reduce our exposure to interest rate risk. While our reporting currency is the U.S. dollar, substantially all of our consolidated revenues and consolidated costs and expenses are denominated in GBP. Substantially all of our assets are denominated in GBP. As a result, we are exposed to foreign exchange risk as our revenues and results of operations may be affected by fluctuations in the exchange rate between the U.S. dollar and the GBP. If the GBP depreciates against the U.S. dollar, the value of our GBP revenues, earnings and assets as expressed in our U.S. dollar financial statements will decline. Assets and liabilities are translated at exchange rates at the balance sheet dates and revenue and expenses are translated at the average exchange rates and equity is translated at historical exchange rates. Any resulting translation adjustments are not included in determining net income but are included in determining other comprehensive income, a component of equity. An average appreciation (depreciation) of the GBP against the U.S. dollar of 5% would increase (decrease) our comprehensive income by $110,000 based on our outstanding revenues, costs and expenses, assets and liabilities denominated in GBP as of June 30, 2016. As of June 30, 2016, our accumulated other comprehensive income was $(374,555). We have not entered into any hedging transactions in an effort to reduce our exposure to foreign exchange risk. Inflationary factors such as increases in our overhead costs may adversely affect our operating results. Although we do not believe that inflation has had a material impact on our financial position or results of operations to date, a high rate of inflation in the future may have an adverse effect on our ability to maintain current levels of research and development and general and administrative expenses. procedures were not effective at the reasonable assurance level due to a material weakness in our internal control over financial reporting, which is described below. Management assessed the effectiveness of our internal control over financial reporting as of March 31, 2016. In making this assessment we used the criteria set forth by the Committee of Sponsoring Organizations of the Treadway Commission (COSO) in Internal Control – Integrated Framework (2013). As a result of its assessment, management identified material weaknesses in our internal control over financial reporting. Based on the material weaknesses as described below, management concluded that our internal control over financial reporting was not effective as of March 31, 2016. · Our size has prevented us from being able to employ sufficient resources to enable us to have adequate level of supervision and segregation of duties within our internal control system. Specifically, there is a limited review of financial reporting and procedures have not yet been implemented to analyze, document, monitor and report on non-routine and complex transactions that require management estimation or judgement. · Related party transactions. Specifically there are limited policies and procedures to ensure that financial statement disclosures reconcile fully to the underlying accounting records and that Board approval of these transactions is not documented. Notwithstanding the identified material weaknesses, management believes the consolidated financial statements included in this Quarterly Report on Form 10-Q fairly represent in all material respects our financial condition, results of operations and cash flows at and for the periods presented in accordance with U.S. GAAP. · Establishing an audit committee with an “audit committee financial expert” within the definition of the applicable Securities and Exchange Commission. The committee will be helped by an outsourced internal audit department to review our internal control processes, policies and procedures to ensure compliance with the Sarbanes-Oxley Act. Phase 1: This phase is expected to take place over the summer and will encompass a detailed study that will allow us to perform a detailed assessment of our current Internal Control Over Financial Reporting against COSO 2013 and the requirements set forth by Sarbanes-Oxley Act section 404. This task will be conducted by an independent expert. Upon completion of the gap analysis, an action plan will be created. Phase 2: During the second phase, over the first part of 2017, the Company will implement the action plan and the related measures. Phase 3: In the third and last phase of this plan, once implemented, we will put significant emphasis on testing the operating effectiveness of the controls. In addition, the Company will focus on the design and implementation of Key Performance Indicators (KPIs) in order to measure the quality of the processes in place, and the efficiency of the controls. This plan will be achieved before the end of the current year ending March 31, 2017. No material changes from risk factors previously disclosed in our Annual Report on Form 10-K for the year ended March 31, 2016. (1) Pursuant to Rule 406T of Regulation S-T, the XBRL related information in Exhibit 101 to this Quarterly Report on Form 10-Q shall not be deemed to be filed by the Company for purposes of Section 18 or any other provision of the Exchange Act of 1934, as amended. Certification by Chief Executive Officer (Principal Executive Officer) and Chief Financial Officer (Principal Financial and Accounting Officer) pursuant to Section 302 of the Sarbanes-Oxley Act of 2002. Certification by Chief Executive Officer (Principal Executive Officer) and Chief Financial Officer (Principal Financial and Accounting Officer)pursuant to 18 U.S.C. Section 1350, as adopted pursuant to Section 906 of the Sarbanes-Oxley Act of 2002.